Kisses is a loud, spunky and beautiful pup from Bandit's third litter. She has quite the outgoing personality and is slowly easing her way into our large pack. We see a well put together pup and we believe she will do remarkably well in the show ring. She is one of the most affectionate pups we've ever had. She wants to be cuddled constantly and is always right at our feet. She loves roaming the field looking for her favorite delicacy, grasshoppers. Her and Twizzler, her brother, love to play fight and do so quite frequently which makes for some interesting evenings outside. Respecting the older dogs has kept her from receiving much discipline. 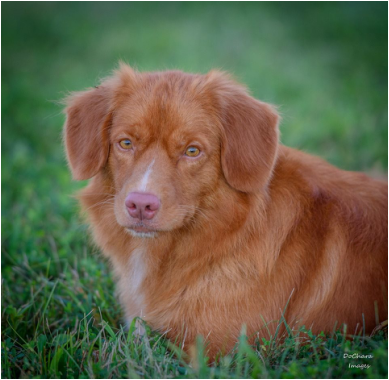 We feel Kisses represents our future in the Toller breed. If you want to learn more about Kisses, click here to view her pedigree.